(Nanowerk News) Inspired by a desire to help wounded soldiers, an international, multidisciplinary team of researchers led by Assistant Professor Conor L. Evans at the Wellman Center for Photomedicine of Massachusetts General Hospital (MGH) and Harvard Medical School (HMS) has created a paint-on, see-through, "smart" bandage that glows to indicate a wound's tissue oxygenation concentration. Because oxygen plays a critical role in healing, mapping these levels in severe wounds and burns can help to significantly improve the success of surgeries to restore limbs and physical functions. The work was published today in The Optical Society's (OSA) open-access journal Biomedical Optics Express ("Non-invasive transdermal two-dimensional mapping of cutaneous oxygenation with a rapid-drying liquid bandage"). "Information about tissue oxygenation is clinically relevant but is often inaccessible due to a lack of accurate or noninvasive measurements," explained lead author Zongxi Li, an HMS research fellow on Evans' team. Now, the "smart" bandage developed by the team provides direct, noninvasive measurement of tissue oxygenation by combining three simple, compact and inexpensive components: a bright sensor molecule with a long phosphorescence lifetime and appropriate dynamic range; a bandage material compatible with the sensor molecule that conforms to the skin's surface to form an airtight seal; and an imaging device capable of capturing the oxygen-dependent signals from the bandage with high signal-to-noise ratio. This work is part of the team's long-term program "to develop a Sensing, Monitoring And Release of Therapeutics (SMART) bandage for improved care of patients with acute or chronic wounds," says Evans, senior author on the Biomedical Optics Express paper. How exactly does a 'smart' bandage work? For starters, the bandage's not-so-secret key ingredient is phosphors—molecules that absorb light and then emit it via a process known as phosphorescence. Phosphorescence is encountered by many on a daily basis—ranging from glow-in-the-dark dials on watches to t-shirt lettering. "How brightly our phosphorescent molecules emit light depends on how much oxygen is present," said Li. "As the concentration of oxygen is reduced, the phosphors glow both longer and more brightly." 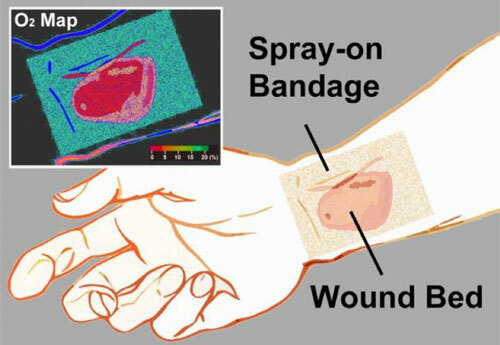 To make the bandage simple to interpret, the team also incorporated a green oxygen-insensitive reference dye, so that changes in tissue oxygenation are displayed as a green-to-red colormap. The bandage is applied by "painting" it onto the skin's surface as a viscous liquid, which dries to a solid thin film within a minute. Once the first layer has dried, a transparent barrier layer is then applied atop it to protect the film and slow the rate of oxygen exchange between the bandage and room air—making the bandage sensitive to the oxygen within tissue. The final piece involves a camera-based readout device, which performs two functions: it provides a burst of excitation light that triggers the emission of the phosphors inside the bandage, and then it records the phosphors' emission. "Depending on the camera's configuration, we can measure either the brightness or color of the emitted light across the bandage or the change in brightness over time," Li said. "Both of these signals can be used to create an oxygenation map." The emitted light from the bandage is bright enough that it can be acquired using a regular camera or smartphone—opening the possibility to a portable, field-ready device. "The need for a reliable, accurate and easy-to-use method of rapid assessment of blood flow to the skin for patients remains a clinical necessity," said co-author Samuel Lin, an HMS associate professor of surgery at Beth Israel Deaconess Medical Center. "Plastic surgeons continuously monitor the state of blood flow to the skin, so the liquid-bandage oxygenation sensor is an exciting step toward improving patient care within the realm of vascular blood flow examination of the skin." What's the next step for the bandage? "We're developing brighter sensor molecules to improve the bandage's oxygen sensing efficiency," said Emmanuel Roussakis, another research fellow in Evans' laboratory and co-author, who is leading the sensor development effort. The team's laboratory research will also focus on expanding the sensing capability of the bandage to other treatment-related parameters—such as pH, bacterial load, oxidative states and specific disease markers—and incorporating an on-demand drug release capacity. "In the future, our goal for the bandage is to incorporate therapeutic release capabilities that allow for on-demand drug administration at a desired location," says Evans. "It allows for the visual assessment of the wound bed, so treatment-related wound parameters are readily accessible without the need for bandage removal—preventing unnecessary wound disruption and reducing the chance for bacterial infection." Beyond the lab, the team's aim is to move this technology from the bench to the bedside, so they are actively searching for industry partners. They acknowledge research support from the Military Medical Photonics Program from the U.S. Department of Defense, and National Institutes of Health.